NZXT continues to expand the fleet of computer cases in 2010 with the new Hades Crafted Series 9 Bay Black mid-tower case. NZXT has designed one more mid-tower case with as many as possible places to mount large chassis fans without overdoing it. The unique look is unlike most on the market today with a unique front panel to assist with hiding your ROM drive, but keep a sinister look. 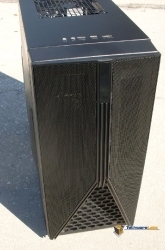 Features such as ports on the back panel for water cooling should get the attention of those who are or are planning on water cooling their rig. Also the Hades series includes two brackets to assist with mounting two SSD drives. Listing just a few key things about the case, let’s take a closer look at what the case has to offer you. Meshed front: 5.25″ meshed bays, meshed door, and meshed bottom panel allows for air to flow into the system with ease.